I have never seen such an odd setup. A track ball and a joy stick to play Quake 3? oh gosh. Thats a scary setup there. Cool, but why are the trackball and joystick so far away from each other, and why does he lean forward so much, looks very uncomfortable. (05-23-2015, 06:00 AM)SPLAT Wrote: I have never seen such an odd setup. A track ball and a joy stick to play Quake 3? Crazy setups were pretty common pre 2000. These days I play with default binds, but back then when you first bought quake/quake2, mouselook wasn't even enabled by default, and the default binds were horrible, so everyone rolled their own custom binds that were all over the map. One of my sad attempts was a Madcatz Panther XL setup for Quake2. It looks like he evolved from something like that too. It was World of Warcraft, of all things, that potty trained me into the standard WASD setup, lol. (05-23-2015, 01:25 PM)machine! Wrote: Cool, but why are the trackball and joystick so far away from each other, and why does he lean forward so much, looks very uncomfortable. Weird setup indeed, but pre-2000 free-looking was a new thing that has seen MANY experiments made to accommodate it on virtually every platform where first person shooters were simply referred to as 3D shooters. 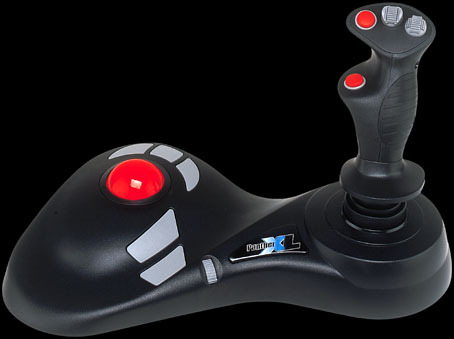 There have been controllers made that included trackballs and flightsticks fused together (Panther XL being one such device, others existed and were actually advertised in manuals for games such as Unreal Gold for example) for PC and even Dreamcast. There have also been 6 dof yokes (Thrustmaster Fragmaster is one such example) made for playing FPS games as well. If you ever run into someone with a setup such as that, then chances are you are running into someone who has been playing for a REALLY LONG TIME, people that use these setups have existed longer than those who bound their keys to esdf or still use cursor keys for movement. I myself actually haven't fully migrated from some of the craziness that was 90s FPS and actually play with an FPS keypad (CyberSnipa PC gamepad 2) to get around not being to fully adapt to a normal keyboard's key layout.